Syrah is an ancient dark-skinned grape variety from the Rhone winemaking region in France where they have been using it to make wine since the times of the Greeks and Romans. It is now grown throughout the world. In fact, South Africa was the first country outside France to plant Syrah in the 1650s. It arrived in Australia at the end of the 18th Century and soon became the most widely planted grape in that country. Australians famously gave it the name Shiraz. Some of the darkest, most full-bodied and age-worthy wines in the world are made with Syrah. Syrah is most known for its bold, fruity flavours from currants, blackberries and sweet blueberries to savoury black olives. The fruit then tapers off and the wine finishes with its signature spicy peppery note. While Syrah makes outstanding single varietal wines, its dark colour and firm tannins make it a favourite grape to blend with varieties such as Grenache and Cabernet Sauvignon. A bold wine like Syrah pairs best with similarly bold foods. 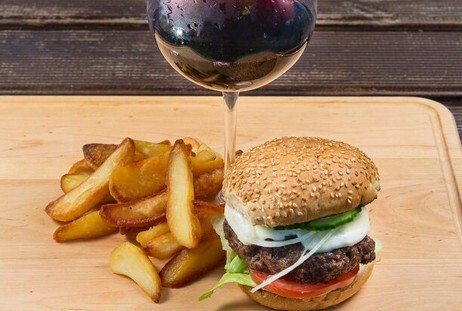 A big, juicy cheeseburger made with top sirloin and an artisan smoked cheddar is worthy of drinking with a fine Shiraz. A flavourful wine like Shiraz should be sipped at a slower pace to properly savour its aroma and taste. For the best taste experience, serve your Shiraz in a Bordeaux-style wine glass.